If you're in J Tree, and you have an hour or so to spare, why not drive over to Cap Rock and walk along the .4-mile-long nature trail? The trailhead is located at the Cap Rock parking area, at the junction of Park Blvd. and Keys View Road. It's easy to find and the short hike is a great reason to get out of the car, stretch your legs and enjoy the day. 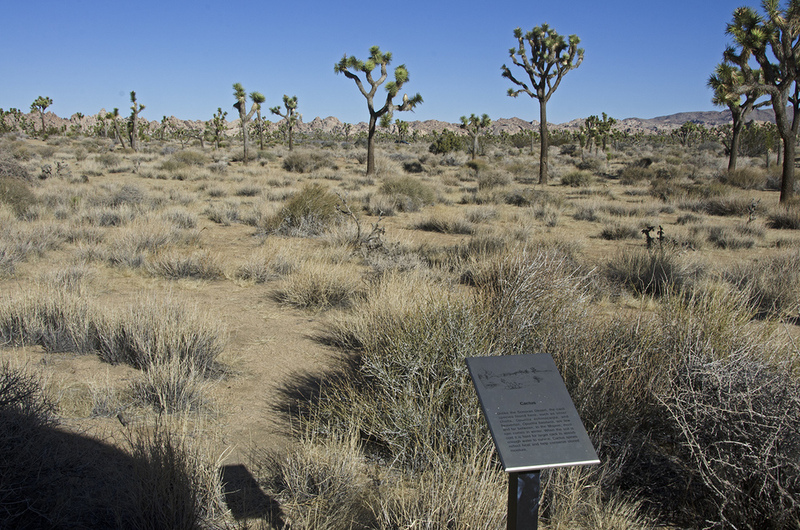 There's a lot of information available along the loop trail, interpretive signs describing the plants, animals and rocks that are part of Joshua Tree National Park. Picnic tables and a restroom make it a great spot for lunch as well. The pictures in this post were taken on January 2, 2014. Many of the plants appear to be dead, but as you'll read, they're just playing possum. I'm going to try to make it back along this trail during Spring to see if I can find things a bit more colorful and hopefully add/update these photos. If you're interested in seeing some of the sights along this trail in 3D, click on over to the intrepid Murbachi's page of Cap and other Rocks. Most of them have names! All the text below the break is taken from the signs posted along the trail. The Mojave Desert, called by Mary Austin "the land of little rain," is located between the higher, colder Great Basin Desert and the lower, warmer Sonoran Desert. Because of its intermediate elevation, much of the year the land bakes in the hot, dry air, but winters can mean snow and freezing nights. Heat and arid winds combine to evaporate most available moisture. How does anything survive? Due to some unique adaptations, many plants and animals are able to meet the challenges of this harsh land. 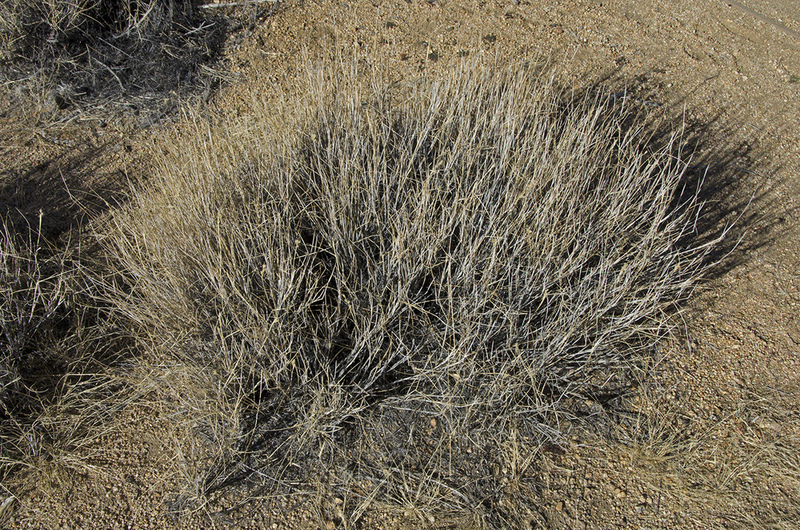 Many Mojave Desert plants, such as this peachthorn, Lycium cooperi, may look dead during fall and winter. They are actually dormant, an energy-saving adaptation. The leaves, when present, are small, which minimizes evaporation from leaf surfaces. The leaf structures of most desert perennials are modified in some way to prevent water waste. The leaves of the Desert almond, Prunus fasciculata, have very tiny hairs that help reduce water loss by reflecting heat and sunlight. Mormon Tea, Ephedra spp., has gone a step further. It has dispensed with leaves entirely and carries on photosynthesis, or food production, in the green stems. Like pines, to which it is related, ephedra bears cones instead of fruits and is wind-pollinated. In areas around large boulder piles, vegetation is thicker and more diverse than in the open areas. Rain runs off boulders and collects around rock bases. This creates a moister habitat for plants such as Goldenbush, Ericameria spp., and Skunkbrush, Rhus trilobata. In the more arid flats, wide spacing is a solution to survival. This reduces the competition for water and sunlight. Big Galleta grass, Pleuraphis rigida, is a hardy bunch grass that grows from underground stems called rhizomes. It forms clumps rather than turf, thus reducing the surface area exposed to the sun. Most desert insects make use of plants. Sometiems the plants also benefit. 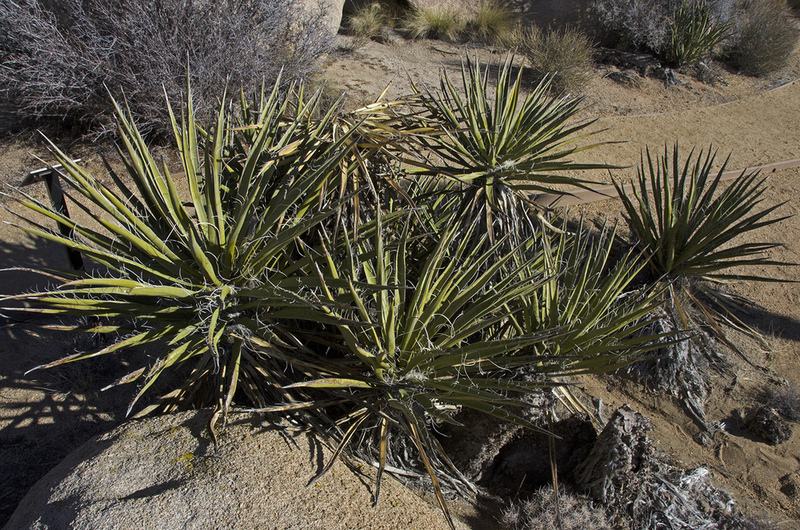 Each type of yucca, such as this Mojave yucca, Yucca schidigera, depends on a species of yucca moth for pollination. The moths pollinate the flowers where they have deposited eggs. This insures a seed supply for both moth larvae and future yuccas. On the boulders above live some colorful lichens, a "marriage" of algae and fungi. In this partnership, the algae photosynthesize to provide nutrients, while the fungi provide protection from environmental extremes. 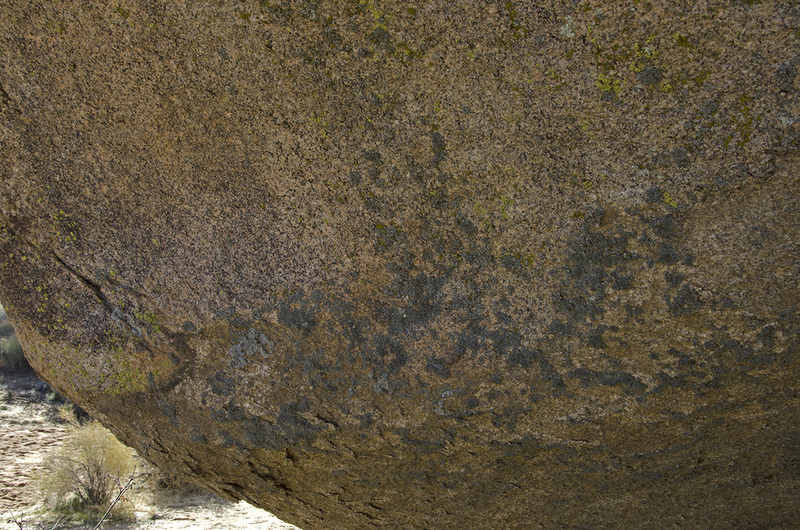 Lichens help to break down rock, a first step in soil formation. The Joshua tree, Yucca brevifolia, living or dead, has a large role in the Mojave ecology. Numerous creatures shelter in the leaves and thatch, and small rodents burrow beneath the roots. Deer and bighorn sheep browse on the leaves. Termites feast on the dead wood, which helps release nutrients into the soil, for use by new plants. Joshua trees can reproduce in two ways. Seeds produce tender seedlings that are sought out by animals. Most surviving seedlings are those lucky enough to germinate under prickly "nurse" plants. Joshua trees can also produce tough offshoots from underground runners, as this tree has done. Unlike the Sonoran Desert, the cacti species found here, such as silver cholla, Opuntia enchinocarpa, and beavertail, Opuntia basilaris, are few and far between. In the Mojave, most rain comes in winter. When the soil is cold it is hard for larger cacti to absorb enough water to survive. Cactus spines reflect heat and help conserve stored moisture. The basic adaptation of desert perennials is the ability of their roots to pursue water. The Juniper, Juniperus californica, an evergreen conifer, needs relatively moist soil and has a deep-reaching tap root. By contrast, the roots of the parasitic Mistletoe, Phoradendron densum, tap directly into the juniper for moisture. Annual flowers are drought escapers, able to wait out years of drought as dormant seeds. Spring blooms will carpet the desert only in those years having the right combination of rain and warmth. But it is probable that even in a good year some seeds of most species remain dormant underground, a "seed bank" to ensure future survival. Life in the desert is possible as long as all residents adjust to its harsh conditions. On this trail you have seen many adaptations of the plants and animals of a Mojave Desert community. What are your adaptations to desert living? Would you be able to survive in this "land of little rain?" note: my adaptations are layers of clothing, lots of water, sturdy hiking boots, s sharp knife, map/compass/gps and jerky.